Different Types Of Divorce In CA? 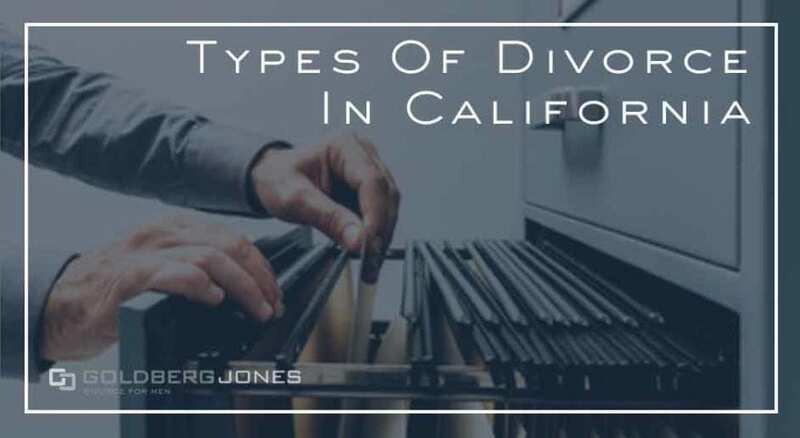 Though it gets thrown around like it’s this big, all-encompassing term, there are actually multiple types of divorce in California. Every case is different, thanks to the individuals involved and the specific situation. So not every approach is an ideal fit for every situation. It’s important to know the various types of divorce and what each means. There are differences and similarities. Some apply to multiple circumstances, while others have specific criteria and only fit certain cases. Being aware of the types of divorce can help streamline the process and get you on the road to your new life faster and easier. California is a no-fault divorce state. This essentially means that, as long as one spouse wants a divorce, the courts will grant it. Before the 1970s, one spouse had to prove grounds against the other. Now there’s no reason to assign blame or show cause in these types of divorce. All that’s required is for one spouse to cite irreconcilable differences, with no hope of resolution, and they’ll get their divorce. Just like the name sounds, an uncontested divorce is when both parties agree on everything. This includes the division of property, child custody and child support, visitation, spousal support, finances, and the rest. These types of divorce don’t go to trial, are generally quick and easy, and usually work best in the case of shorter, simpler marriages where the spouses are on the same page. It’s still a good idea to consult a divorce attorney just to make sure everything is fair and on the level, but it’s not a requirement. As you might imagine, a contested divorce is somewhat more adversarial. How much, however, depends on the level of conflict and disagreement between spouses. This is the most complicated, contentious form, and is probably most like what comes to mind when you think of divorce. When spouses can’t agree on issues it often leads to mediation, arbitration, or even a full trial. California allows for summary dissolution. This is an uncontested no-fault divorce that applies to short, uncomplicated marriages. It’s often a quick and easy answer to divorce woes, but you do have to meet a number of conditions. and the couple doesn’t own joint property—no lands, buildings, or real estate. and there’s less than $40,000 worth of joint property acquired during the marriage. These last two exclude cars. If you check off all these boxes, summary dissolution may work in your case. One common divorce strategy is mediation. In these types of divorce cases, the two sides work together with a third-party facilitator to hammer out any differences outside of court. The moderator helps the spouses work out conflict and disagreements. Mediation often settles child custody, handle the division of property, create parenting plans, and determine maintenance support. This is a non-binding, voluntary process, and both parties must agree to the terms. The ultimate aim of collaborative divorce is to resolve disputes in a respectful, amicable manner. Both spouses, armed with lawyers trained in collaborative law, come together in a process aimed at reaching fair agreements that are mutually acceptable to both parties. Collaborative divorce works best for couples willing and able to play nice and cooperate. It’s often less costly and combative than a traditional divorce, and the final say does not fall to a judge. The parties sign a participation agreement, and the lawyers draft a formal agreement once everything is settled. If an agreement can’t be reached, you terminate the process and move forward with other means. One point of note: collaborative attorneys can’t continue to represent you in the litigation process. If collaborative divorce fails, you’ll have to retain other counsel moving forward. It’s part of the deal. In California, legal separation is also an alternative to divorce. Divorce is final and absolute. On the other hand, legal separation is not so definitive. In practice, it serves as a de facto divorce, though the marriage technically remains intact. This strategy provides time to hash out the particulars of a divorce, including custody, financial matters, the division of property, and more. The couple can’t continue living together, though their marital status remains unchanged. This strategy fits situations where a marriage is essentially over, but divorce isn’t the best option. This is often for religious reasons, to serve as a step towards eventual divorce, or even for continuing health care. Knowing the types of divorce goes a long way towards helping you choose the appropriate strategy. Depending on the circumstances, it can streamline the process and help get you to the end faster and more efficiently. If you have questions about the types of divorce, contact Goldberg Jones at our San Diego office.